Nectarines must have been a sacred fruit. My idea of heaven on earth. When in season they are sweet, juicy, tender, a perfect dessert all on their own. But sometimes you want something a little fancier. Maybe your mother in law is coming over for dinner and you need something easy, but impressive. Or maybe you are like me and need to have something sweet and fruity for dessert every night for the entire summer. That’s what happened this afternoon. I sat at the kitchen table thinking about dinner and absently staring at a bowl of yellow nectarines I bought yesterday until I was no longer thinking about dinner. I was dreaming up dessert. Something simple and not too unhealthy, but still sweet. I almost made a galette, but decided on a crisp instead. Both are stunning to look at and are perfect with summer fruits, but a crisp is faster and easier then making, chilling and rolling out dough for a tart. It took all of 20 minutes to prepare. Just slice the fruit in half and peel away the pit, then cut each half into three slices. When you have about 3.5 cups of fruit toss it with a couple teaspoons of sugar and of flour. 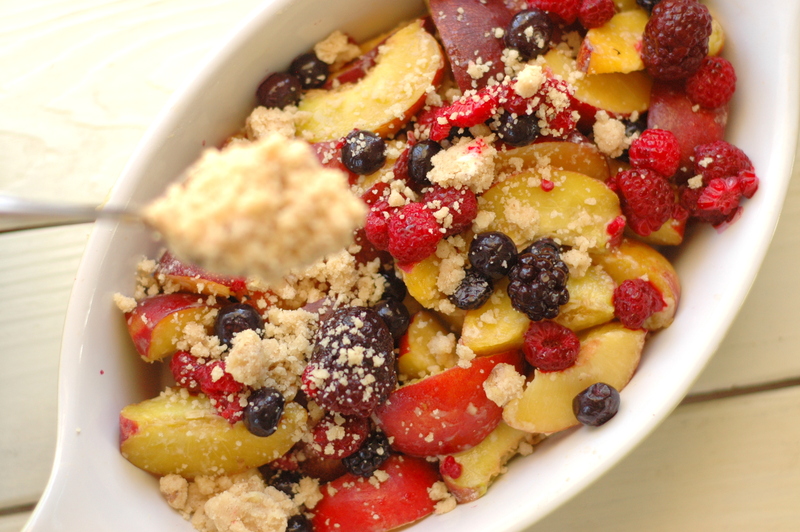 Dump the fruit into a baking dish and sprinkle with a handful of frozen or fresh berries. Then set aside to make the crisp topping. To make the topping massage the flour, sugar, seasonings and nuts into small cubes of cold butter with your fingers until it resembles clumpy wet sand. Sprinkle evenly over the fruit and bake on a cookie sheet for 45 minutes. That’s it! I like mine pretty hot so I wait about 15 minutes for the crisp to set before scooping some onto a plate. You could wait longer, but I really don’t think you’ll be able to. If I had some vanilla ice cream I would add a scoop on top as well. Preheat oven to 375 degrees F. Toss the sliced nectarines with the sugar and flour in a large bowl then spread evenly in an ungreased ceramic baking dish. 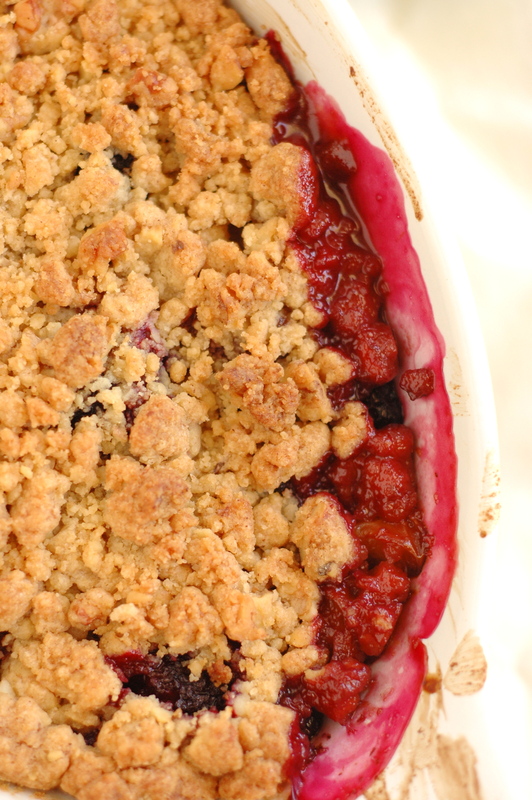 It’s best to use a smaller dish and have a deep layer of fruit. Sprinkle a handful of berries over the fruit. 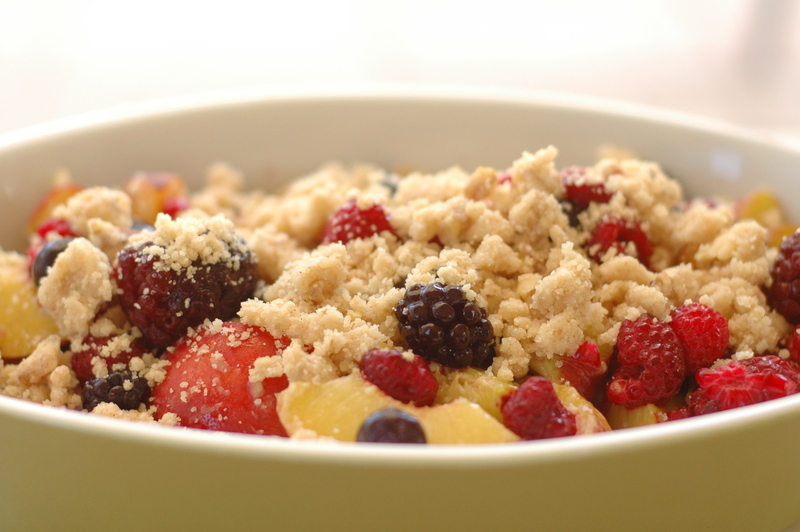 Evenly cover the fruit with crumb topping and bake for 45 minutes. 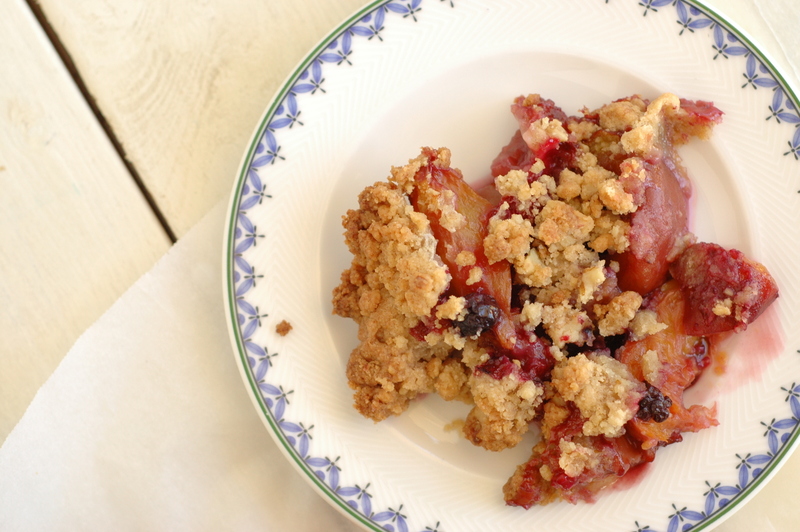 Check after 35 minutes and if the crumb topping is browning and the fruit has not started to bubble up then cover the crisp with foil or parchment paper for the last 10 minutes. After 10 minutes check to make sure the juices are bubbling through the crisp and the fruit is fork tender. Remove from the oven and allow to cool for at least 15 minutes. Serve warm, with vanilla ice cream if you have it. Toast the walnuts for a few minutes in the oven or toaster oven. Let cool then chop into small pieces. Mix the nuts with the flour, sugars, salt, cinnamon, and nutmeg. Add the butter and massage the butter and flour mixture together with your fingers or a pastry cutter until it is well mixed and resembles clumpy wet sand. Keep in refrigerator until ready to use. Can also be frozen for later use. My brother-in-law brought me POUNDS of nectarines! I’ve made jam, and a cobbler, and still have 28 cups cut up in the freezer (seriously). Thanks for the crisp idea! I am so jealous! One day I would love to plant a few nectarine and peach trees. Have to buy a house first though! Hey! I made this tonight – yum! 🙂 I’m having problems with my euro oven….and have been baking as way to figure out how to use the different settings. This recipe helped me isolate and check off one type of heat + pan. Plus, it was SUPER delicious. 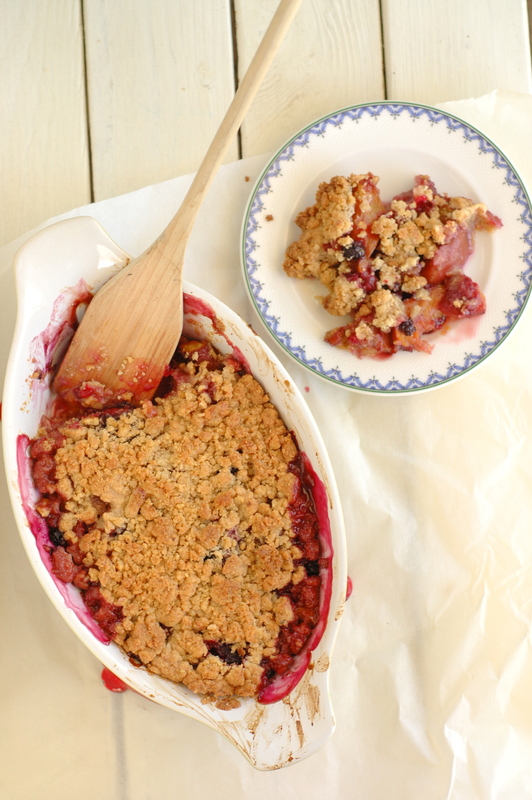 I think the nutmeg adds a really nice touch in the crumble topping, together with the nectarines. Nice combination :-). Thanks! I love nutmeg 🙂 if a recipe calls for cinnamon I usually throw nutmeg in there too.